Jason Bourne. The ultimate man. The trained assassin who has an arsenal of strength, tricks and gadgets to complete his missions. This article aims to dissect the original Jason Bourne film trilogy, and the later two films, so that you can soak up as much information on Jason Bourne as possible. In the Identity, the watch Bourne wears throughout the trilogy is a TAG Heuer’s LINK Chronograph. In the Supremacy, Bourne uses a Rotring 600 pen. When trying to temporary restrain another agent, Bourne hands him a zip tie to use as handcuffs and put them on his wrists in the front and cinch them using his teeth. In the Ultimatum, Bourne uses a monocular, which is basically half of a binocular, and is more compact and subtle. In the Legacy, after emerging from frigid water, Cross uses an emergency survival blanket. In Jason Bourne, Bourne uses a lockpick set to enter an electrical control room. In Jason Bourne, he uses a GPS tracker. We recommend a Tile, which is light and barely noticeable. The gun The Professor uses throughout the film is a Swiss SIG 550 Sniper. The gun in Bourne’s safe deposit box is a SIG-Sauer SIG Pro SP2009 (9mm) pistol. Bourne uses an American Express Platinum Charge Card, which we discover when he opens his safe deposit box. Here’s our quick guide to virtual credit card numbers. The watch Bourne wears throughout the trilogy is a TAG Heuer’s LINK Chronograph. When Bourne is on the ship, recovering from his loss of memory, he continues to work out, doing pull-ups, etc. The lesson here is to always stay in shape. After Bourne assaults two police officers, he ditches his coat to remove potential identifiers. Bourne uses lockers provided by train and bus terminals to stash bags filled with money, weapons and identities he can use. This idea of creating caches was also detailed in Emergency by Neil Strauss. Bourne fights using a type of martial arts that is a combination of Filpino Kali and Jeet Kune Do. Bourne has a tiny laser projector in his hip that contains his bank account number. When going removing items from his safe deposit box, he takes everything except the gun. While some may discount this as a stupid move, I consider it a smart one. Sometimes, carrying a gun with you can draw more attention and/or bring trouble. When attempting to escape from the embassy, he grabs an emergency map from the wall, then knocks out a soldier and removes his communications device, so that he can hear where the soldiers are. The re-dial button on the phone is your best friend. You can use this on landlines without call logs, or if the phone does have a call log, you can use that as well. The point here is to retrace steps and discover agendas. (i.e. redials to the airport, taxi service, hotel, etc.) 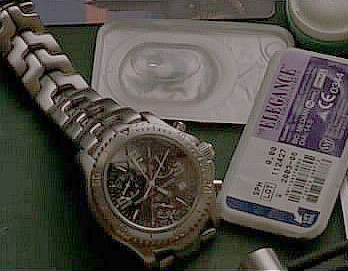 In the film, Bourne uses the re-dial button to discover another lead on his identity. Bourne is an expert of fighting based on his surroundings. In a high action fight in his apartment, he reaches around for a makeshift weapon, settling on a ballpoint pen, which he uses to stab the assassin with. Use your surroundings! During a high speed car chase, Bourne instructs his companion to look away from the police. This is most likely to avoid the confirmation of who is in the car. Your instincts are usually to constantly look around, but that’s more likely to burn you. When Bourne ditches Marie’s car, he makes sure to wipe down everything. Later, it is proven a smart move when a police officer says something like, “You’ve been here for 3 hours and you still can’t find a fingerprint!?!”. Create dead ends for your followers, and leave no traces of yourself. The check in, or list of visitors is a great source for information. At a morgue, Bourne rips out several sheets to examine later for links to the person who took a body. In one scene, Bourne is placing duct tape over a car window. While he may be mending the broken window, this may also be just to block the view in, or it might be to prevent gun shots from shattering the windows. When instructing a friend to lay low he says, “No friends, nothing familiar.” This basically sums up what you should do if you want to ditch your identity. Bourne attaches a tracking device to a vehicle he suspects after luring agents to his specified location. A video on how to fight like Jason Bourne. After overpowering two officials, Bourne copies the SIM card of the agent who received a call from the CIA, using a gadget he can then use to listen in on the calls. Here is some more information on the process: the how-to and the gadget. When doing this, he uses a product from CHIPDRIVE and a GSM plugin SIM adapter. The prop used for this can be found here. Bourne uses a Rotring 600 pen. Bourne uses a Siemens ME45 phone. Bourne uses a Sig Sauer PRO gun in Moscow. In all of the movies, when Bourne uses a cell phone, he uses a hands-free accessory to talk. A Bluetooth headset is much more discrete but its signal can be intercepted more easily. Bourne, when detained and questioned, says nothing, assuming a sort of poker face. Some may say the law is on his side, and this is a smart move for Bourne. Others may think this is stupid. At any rate, Bourne accomplishes what he set out to do. Bourne then steals a car for transportation. This is highly illegal, so please read our legal section before learning more. This and this could help. In fighting another agent, Bourne again relies on his surroundings to use a rolled up magazine as a weapon. The type of fighting he uses is called Escrima, an old Philippine martial art. In ancient times, it used sticks, but now you can use everyday objects, such as a rolled up paper or a pen. In order to kill someone Bourne uses an electrical cord to strangle him. When fighting, be sure to stay away from cords that might be used to strangle you. After realizing that backup has been called in, Bourne places a magazine inside a toaster, starts toasting it, then breaks open a gas line to create a makeshift bomb. In minutes, when agents are about to enter the house, it blows up, leaving Bourne a nice exit. Bourne affixes a fake license plate he got from his bag to a car he stole to prevent police from finding him quickly. When setting up a meeting place, Bourne always picks the best possible location. In a particular scene, he chooses a location which is set to be the location of a protest march. This makes it difficult for surveillance, and using the protest as a cover, he manages to carry out his mission. When he then realizes that his target is wearing a wire, he brings her into a room on the subway system to block the wire from broadcasting more. You can use this knowledge to perform similar feats if necessary. Bourne uses a prepaid phone card at a phone booth for security and privacy to prevent tracing. When looking for a target he thinks is staying in the city, he calls the major hotels in the city, looking to speak to her. Bourne asks the front desk to call a room (that he knows is already on the phone) so that he can see the room number displayed on the phone. Bourne uses vodka to disarm one cop in Russia by throwing it in the man’s face. He also uses the same bottle to disinfect a gun shot wound, something I don’t recommend for even a paper cut. Alcohol works as a disinfect in a pinch, but it can also damage your wounds. In the film, Bourne uses a monocular, which is basically half of a binocular, and is more compact and subtle. Bourne uses a Dual Tone SIG Pro SP2022 in the beginning of the film, and other than the other guns he removes from agents and officers, he uses another SIG Pro. Bourne buys a pre-paid phone at Waterloo Station, then activates it and drops it in his target’s pocket. This is done to make sure that other agents can’t listen in on the call. In a car, drowning in water, Bourne gets a good breath of air by swimming to the roof where an air pocket formed. Bourne begins to start his new life, grabbing what he had hidden around the house. He hides his passports behind a photo frame and money behind his desk drawer. Bourne instructs the journalist to do several things to prevent agents from getting to him. The first is to let the agents target someone else, in this case, a unknown man in a hoodie. Bourne instructs the journalist, Ross, to approach the man, and turn around, to turn suspicion to the man in the hoodie. Next, Bourne instructs him to move into the station as soon as a bus comes, to block the cameras from following him. Bourne has Ross tie his shoe for several minutes, to shake the team of agents trying to track him down. Bourne coaches Ross on how to stay out of the CCTV’s scanning, by keeping on a path that would not be picked up by the camera. When ever usually-moving security cameras stop moving, it usually means that they are off, and when they are suddenly turned off, it usually means that another power is about to do something they don’t want on camera. In order to turn attention towards a specific door, Bourne takes a flashlight, some tape and a fan, and attaches the shining light to the fan, to create the illusion of someone pacing under a door. Knowing that agents on the other side will be arriving shortly, and needing to buy some time, Bourne calls the cops, telling about Americans who are shooting, then fires several times to get others to call in, then leaves. When the agents arrive a minute later, they get detained by police. In Tangiers, Bourne is traveling over roofs, evading police. In order to out run the police, he grabs some clothing off of a clothing line, and wraps it around his hands in order to get over glass covered walls. In order to obtain the voice of a safe’s owner to open a voice activated safe, he calls him, recording him say his name. This, per se, is not so much a Bourne trick as a method used by an ex-agent, who completely dismantles her cellphone so that the agency can not track her down via cellular triangulation. Even when your phone is off, it can still send signals if hacked. In addition, (as FYI in the comments pointed out), she also uses it to indicate to Bourne where she went, like breadcrumbs. Bourne improvises another everyday as a weapon in a fight scene: a hardcover book, which he uses to brutally smash a guy’s head with. In the same part of the film, he also uses a towel as another improvised weapon. The actor behind Desh shows how they filmed some of the stunts and gives an interview. After emerging from frigid water, Cross uses an emergency survival blanket. Cross carries a Beretta 92FS. Here’s a complete run down of the guns in Legacy. Keeping his pills around his neck in a pill canister is important to keep them safe. His watch is a special edition TOP GUN IWC Pilot’s Watch, Double Chronograph Edition. Here’s a great guide to Cross’ winter gear. Cross’ wilderness fire is built with logs upright, presumably to protect the fire from being blown out by wind. To keep wolves at bay, Cross uses a lit torch of fire. He splits up with his partner when he has a bad feeling. To prevent tracking signals from being sent, Cross uses a metal and foil tin to act as a sort of faraday cage. Knowing that his tracking device detects body heat, he puts it in a wolf to replicate the heat signature. A fire extinguisher is as a makeshift gun/propulsion device. A saw is used as a sound distraction device. Cross uses a disposable camera to de-magnetize digital passport chips. Normal people shouldn’t need to do this, but you can use an RFID blocking passport envelope. There’s an old con artist lesson that’s used in the film: act confident, act like you belong and people will believe you belong there too. By forcing an emergency shutdown, Cross helps provide cover for his escape. Aaron Cross, just like Jason Bourne, speaks a ton of languages. Duolingo can help you master many. The gun he uses is a SIG-Sauer P226R. Here’s a complete run down of his other guns. Here’s a guide to what Bourne wears. Bourne uses a lockpick set to enter an electrical control room. In Las Vegas, Bourne uses a GPS tracker, with audio recording capabilities. It’d probably be easier to use cell phone for that though. Tile is probably one of the most common trackers out there. Meeting in the middle of a protest, seeking out the chaos, makes it more difficult to be tracked. A bandaid kit tin is used to contain a USB drive. Catching an attacker off guard, Bourne slams the door open. Bourne uses the train system to avoid being tracked through plane travel. Setting off multiple fire alarms to cause a distraction is straight out of the Bourne playbook. When finding an assassin, Bourne points a spotlight to temporarily blind him. What tricks and tools do remember? What did you like about the Bourne trilogy? Let us know in the comments! Sources for this article included Wikipedia, IMDB, this article, and watching the films more times than I care to say. Your site looks very interesting and informative! I found your blog via Yahoo while searching for discount security cameras and your post, Lone Iguana – The Utterly Ultimate Complete Guide to Jason Bourne [How to Be Bourne] definitely captured my attention. I have seen many other so-called sites and they have been far from good quality.Your site has all the key ingredients to pulling in visitors. Good work on paying attention to detail, you’re on your way.. I think Bourne shoots a gas tank, not a car, to create a smoke screen. One shot at a car with a shotgun won’t blow it up. Good call, thanks! Updated the post. Bourne Supremacy: The “disposable cell phone = non-traceable privacy” thing is a total scam. Whenever you make a call with one of them, the phone’s serial number is transmitted during the call. The police can pull this number out of the signal, contact the phone manufacturer’s distributor and find out what store it was shipped to for sale. After that, it’s a simple matter to check the store’s records to find out when that phone was sold, pull the security video for that time frame, and voila! You’re cooked. Wow, good point. I think that Bourne’s goal, however, was not complete anonymity, but a large time delay before they could actually trace the owner. And, arguably, he didn’t even need that, but only another line the CIA hadn’t put a trace on yet. Thanks for your comment. Entering a US Embassy would only be of use if you’re a US citizen and ideally carrying your passport. Find the Embassy for your own nation! Great point! Thanks for your comment! Nice job Max. It came out really well. When Nikki takes apart her phone, she is leaving a “bread crumb” trail of sorts pointing to her direction of escape, not only to not be traced. this is useless to me because i AM jason bourne, b*tch. You realize that this is fiction, right? It’s just a writer sitting in a room somewhere coming up with things that he thinks are neat and would help the story moving? Excellent comment, something we should all keep in mind. The monocular scene is very unrealistic: the zoom-factor is enormous, so large that he can read the reports Vosen is putting in his safe. You would need a very stable tripod (and hold your breath!) to get such a perfectly still image at that rate of magnification. Bourne holds the monocular loosely in his hand, yet the picture he sees is still and razorsharp…. My son IS Jason Bourne. cool article. I believe its “duct” tape though. Also: “per se”, not “per say”. It’s latin. 2. So the airbag wont hit him in the face (also seen in Bourne Notice). Thanks for collecting all these tricks and tools. you forget the celular that used who kill dany sorm¡¡¡ it´s a celular that print your finger like the pantech ¡security¡¡¡ ¡¡¡¡¡¡¡i see it in supremacy ………i think is a HP celular but i dont know more¡¡¡¡¡¡¡¡¡do you ??? Hrm… I think I know what you are talking about: the government agents who take his fingerprints and print them on sticky paper in order to adhere them to objects at the scene of the crime. Not sure about the equipment used. To Mister Devious’s comment about being able to trace prepaid cell phones, there are several methods one can use to remain anonymous and yes, have in fact a cell that can’t be traced to you. If anyone is interested, I will post one or two ways here. Awesome, I would love to hear them! The easiest (and perfectly legal) method for buying a prepaid cell phone is simple: first, always use cash. Cash leaves no paper trail, and even though an overwhelming number of people don’t carry much of it anymore, preferring to use debit cards, always remember, whatever you buy with anything other than cash leaves an itemized list, time/date stamp right back to you. The second step is to wear a ball cap pulled down a bit in front. You may go even further and add to the disguise (facial hair, adding layers of clothing to add weight, wearing a disposable outfit-basically an outfit you put together for five dollars at a Salvation Army or Goodwill months before), but a good cap and sunglasses will work wonders. If you are really paranoid, you can walk to the location, use public transportation, or park your car a few blocks away. In a nutshell, as far as appearance goes, don’t stand out or make conversation with anyone if it can be helped. The third step is to scout out locations that DO NOT employ video cameras. Yes folks, there are tons of places that do not. There is a local open air market not far from me that has no cameras except inside the facility. Guess what several vendors have in kiosks? Yup, prepaid cell phones. There is also a flea market that offers the same thing. You might be better off buying a prepaid from a flea market dealer: oftentimes they are the end of the line sellers of such wares. What that means is that the first level seller, whether a cell phone provider or a “real” store like a pharmacy or whatever, has basically shipped the product back to receive credit and a second tier company bought the sent back/overstock, think Big Lots, etc., sent it back, and now this guy has a slew of them he bought, oftentimes for next to nothing. Trust me, it would be very difficult to trace this phone even with a serial number broadcast. And even if it was, all the guy could probably say was that he sells phones like that. These people are open market people that I equate with street vendors in third world countries. Chances are the guy couldn’t even tell the police/Feds what day he sold the phone on and even if by some miracle he could, you paid cash, had a ball cap and sunglasses on, and walked off, fitting in perfectly to the environment. Remember the rule when prepping for a mission: don’t stand out in appearance or actions. This is one legal and simple way to purchase a prepaid cell phone. You can add a layer of safety to the above by purchasing your prepaid cell phone in a different city or state. There are a few other methods, but I can comfortably share this one with you. Enjoy. Wow- thanks for the advice! It is no problem; I will add items as time permits.